When Noctua announced that their next-gen 120mm A-series fan was finally available, I thought it must be some sort of dark Austrian humor. After teasing us for more than 3 years at Computex and all the delays, I couldn’t believe it. But it’s true, it’s finally here. The NF-A12x25 is upon us, so I ordered 3 of them to test against their bigger NF-A14 sibling as case fans. For those wondering this is not a sponsored review, I bought the fans with my own money and I do this for “fun”. Ever since my brother used a Thermaltake Orb Dragon 3 in one of our early PCs, I’ve craved silent computing. I addressed most of this in my first system build/case/cooler reviews, but there is always more silence to eek out. Can a Next-gen120mm fan hold up to or exceed a loved and venerated 140mm fan in cooling and sound performance? Or did I just waste a bunch of money on a fool’s quest for silence? Let’s find out! 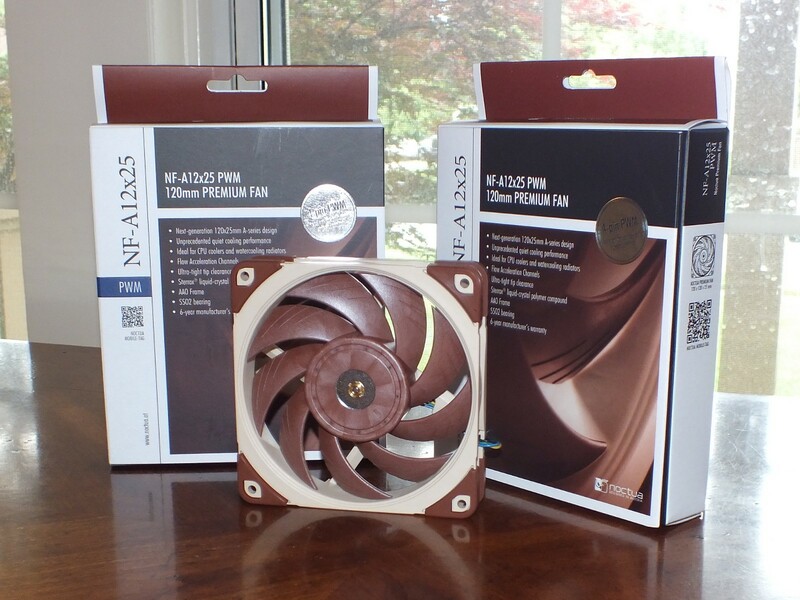 Taking the A12 out of the box, we are presented with a familiar sight for Noctua packaging. Included is the fan itself, a 4-pin Y-Cable, NA-RC14 low noise adapter, 30cm extension cable, NA-AV2 anti-vibration mounts, bog standard fan screws, and a silicone anti-vibration gasket for water cooling radiators. The fan itself has a 20cm cable, and all the cables are covered in a nice black flexible silicone cable shroud with nicely done heat wrap ends. The level of detail on the cables has always been top notch for Noctua, and that tradition continues here. Looking closer, we can see the ultra-tight 0.5mm clearance between the fan and the shroud. 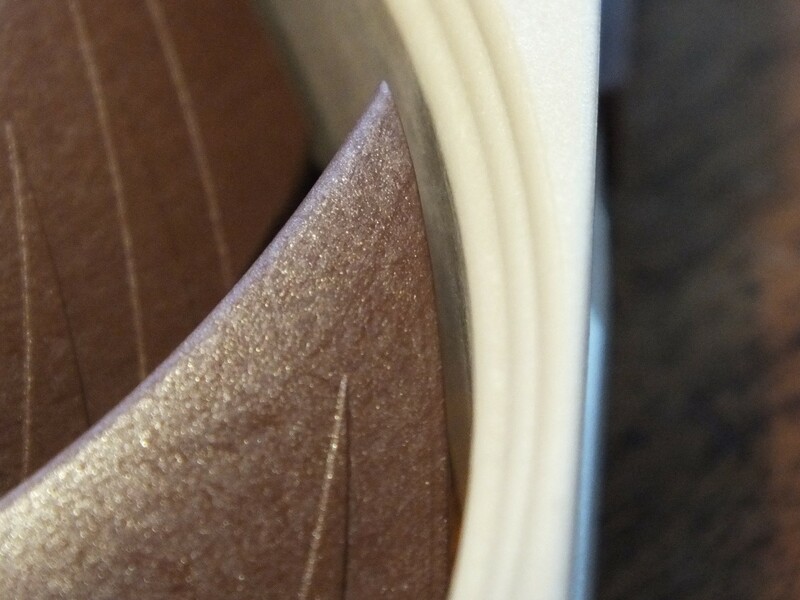 You can also see the texture of Noctua’s new Sterrox® liquid-crystal polymer compound. It’s shinier than their standard glass fiber reinforced PBT and has a directional texture that could be from mold injection, the polymers themselves, or the glass fiber reinforcement. If the polymers and the glass fibers are more aligned along the longitudinal axis of the blades than Noctua’s normal fans, it should give it the extra tensile strength needed to prevent impeller creep in the the tight clearances. The frame is comprised of Noctua’s usual glass fiber reinforced PBT plastic, and all the mounts/corner guards are brown silicone rubber. The build quality is the usual Noctua top notch. There’s no wobble or slop on the impeller, the shroud and impeller are both uniform in their castings, and it feels solidly built. To test the fan against it’s big brother the NF-A14, we’ll be using my airflow-focused PC as a test bench. I’ll be testing 2-A14s vs 3-A12s, with both a “Silent” fan curve and a 100% speed fan setting using the included low noise adapters. This combination should give us an idea if we can been cool + quiet. I’ll also test a 5th setup where the CPU fan profile is also set to “Silent” instead of our control 60% fan speed to see if we can eek out any more silence. We will be measuring Noise and Temperature readings for each setup iteration. To generate as much load and heat as possible, IntelBurnTest (IBT) and Heaven Benchmark 4.0 (HB) will be run in tandem. IBT will run a Standard Stress Test utilizing all cores/threads, and HB will run a benchmark at Ultra Quality, Extreme Tessellation, 8x Anti-aliasing, and at 1920x1080 windowed resolution. 1 meter directly in front of the case intakes. 1 meter diagonal to the front/left/top vertex corner of the case, which tends to be where my head is while sitting in a chair with the case on the floor under the desk. The environment will be as controlled as possible, with HVAC, refrigerators, and other noise generating sources turned off during readings. Tests are run during quiet times, which resulted in an approximately 27.1 dB background noise level. Temperature readings will be collected using HWiNFO, and logged to CSV for analysis. The environment will be as controlled as possible, with HVAC keeping the room steady at a 22°C base temperature, and only temporarily shutoff at the beginning and the end of tests to measure noise levels. To limit the number of variables to test, the CPU fan will be set to a constant 60% RPM. When isolated, this results in a 27.8 dB(A) measurement at 1 meter from the front of the case and is slightly discernible when listening carefully with an ear pointed towards the case. At head level the CPU fan noise is not audibly discernible or measurable. For the “Silent” fan curve mentioned above, I used ASUS’s standard “Silent” fan profile, which has the following curve points: 20% @ 20°C, 70% @ 70°C, 100% @ 75°C. 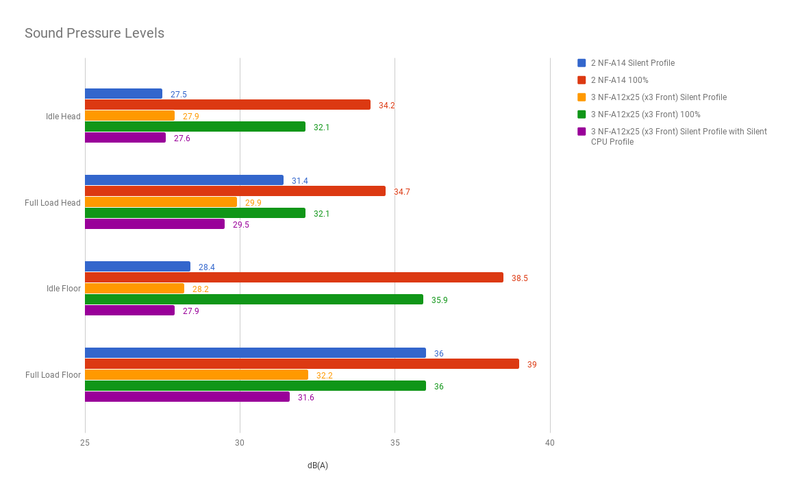 From the data below, we can see that the setups are very close in cooling performance, but the 3 NF-A12x25’s do have a few degree edge over their 140mm brothers. 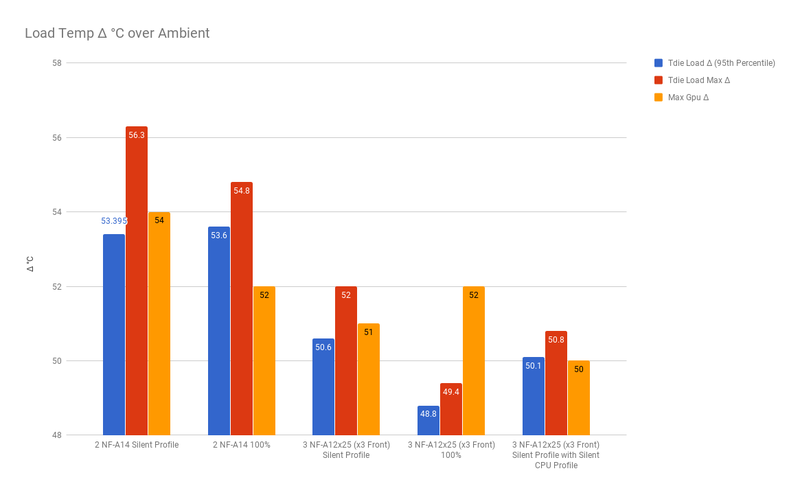 Setting either fan setup to 100% speed does increase the cooling power, but the silent fan profiles seem to cool the system adequately with max temps in the 70–75°C range for CPU and GPU. As for noise levels, we see a bigger difference here between the Silent and 100% fan profiles, as well as between the fans themselves. Idle noise for all “Silent” setups is right at or above ambient noise levels, while a 100% setting can increase the noise to 32–38 dB. One specific comparison is the difference between Idle and Load for the Floor/Silent profile tests. The A14’s go from 28 to 36dB, while the A12’s only go up to 32dB. Overall we can see that the A12x25’s are quieter than the A14’s at every measurement by roughly 3 dB. At full load with a silent profile though, we can keep under 30dB at head level, which has been a holy grail level for me. Here are some recordings taken 1" from the front grill of the PC for each fan set at 100% with the L.N.A. They’re both still very quiet, so use headphones and turn up the volume. The NF-A12x25 has a smoother noise profile, and while slightly more high pitched you hear a more pronounced “moving air” noise. The NF-A14 has a more pronounced hum/”rrrrr” fan blade sound, which sounds like an old propeller plane flying in the distance. This comes with a lower pitched sound profile that seems to reverb in the case a little more than the A12’s sound. The temperature and noise measurements for the NF-A12x25 show that in this setup it has an edge over the NF-A14 when used as case fans in these configurations. 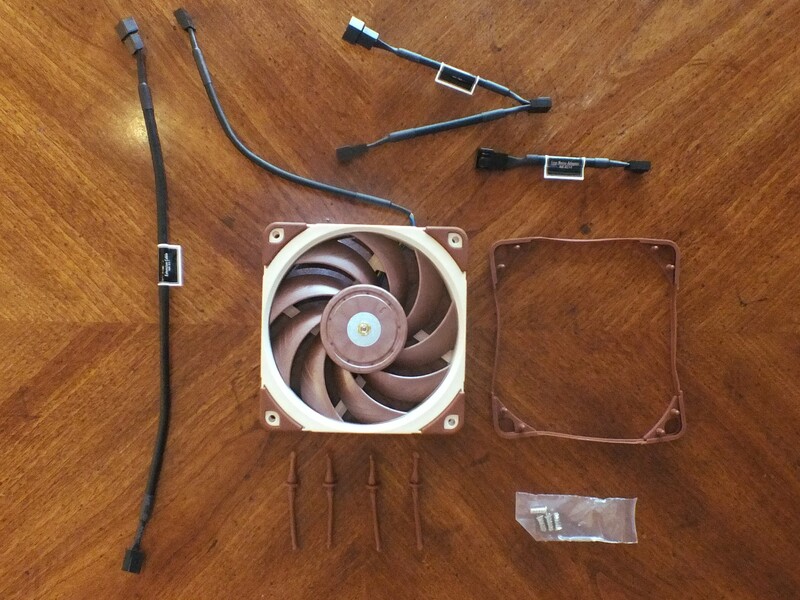 Noctua’s fought hard to engineer a better fan, and from what I can deduce they’ve succeeded. I look forward to seeing others test these fans on CPU coolers and water radiators to see if the advertised pressure increases show up as well. The only negative I can find about this fan is the price. Right now it’s at a full new-product MSRP of $29.90 in the US. I’d recommend these fans for anybody looking for ultimate silence in case fan cooling, or those that can’t stand “propeller” fan noise. Software Engineer at a database company. Views are my own.